The approach illustrated here involves length scales for a single computation shown by the circles, with the full range of scales (nm to km) covered by different overlapping models. Like a sponge below the surface of the Earth, porous sedimentary rock traps petroleum and natural gas in reservoirs until these resources are pumped through manmade wells and extracted. Increasingly, sophisticated simulators that model the flow of water, oil, and gas are being used to analyze extraction strategies as well as potential environmental impacts of energy production in the United States. Modeling and simulation is also enabling scientists to explore the safe and efficient use of subsurface geology for carbon dioxide sequestration and nuclear waste isolation. 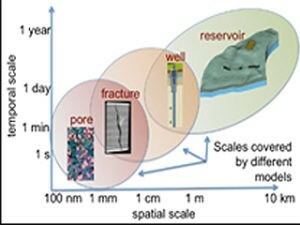 However, scientists need more computing power to model the many length and time scales important to predictions of reservoir resources and long-term integrity—from micron-sized pores in rock, to small fractures, to fluid flow, to mechanical stressors like seismic activity and drilling. At exascale, researchers will be better able to resolve these multiple scales and their impact on each other over long periods of time. 11/11/16 The Department of Energy’s Exascale Computing Project (ECP) announced that it has selected four co-design centers as part of a 4 year, $48 million funding award. 11/10/16 The Exascale Computing Project (ECP) has announced the selection of 35 software development proposals representing 25 research and academic organizations. 09/07/16 The ECP announced its first round of funding, choosing 15 application development proposals for full funding and seven proposals for seed funding.